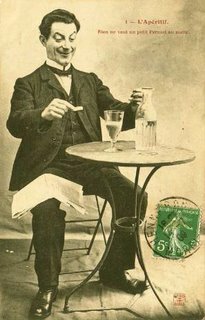 If it wasn't for the scarcity of wine in the late 1800's due to a virus, Absinthe wouldn't even be a blip on the radar. But it was scarce, so Absinthe did get popular. Though it's definitely a heavy liquor, it doesn't cause insanity or blindness or things that most of us were led to believe by society and, funny enough, the wine industry. Wineries tried to regain their popularity when the virus was dealt with by saying Absinthe turned you into a cold-blooded killer (among other things). Though the misinformed vagaries of Absinthe are always good for a joke. The Accidental Hedonist has published a short history on Absinthe and is worth the read for anyone that's even so much as heard of it (ie Everyone).